Sun and clouds mixed. High 63F. Winds NW at 5 to 10 mph.. Mainly clear. Low 37F. ENE winds shifting to NNW at 10 to 15 mph. 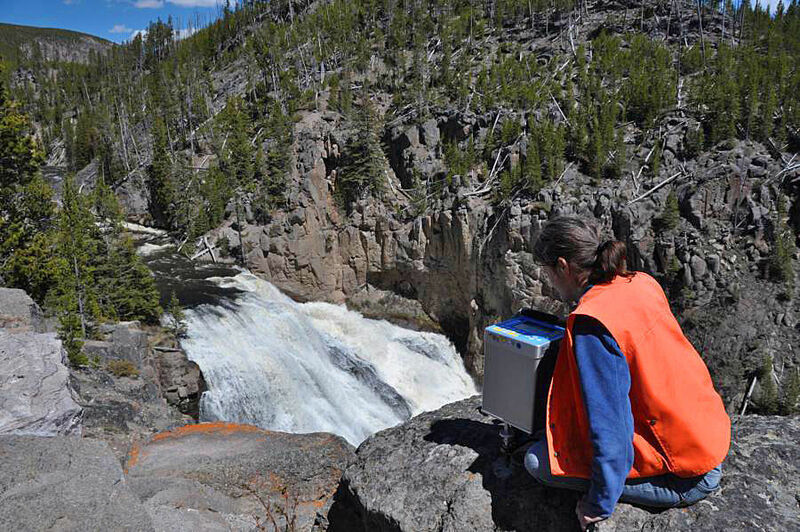 Geophysicist Elske de Zeeuw-van Dalfsen (Royal Netherlands Meteorological Institute) collects a gravity reading from a station near Gibbon Falls in Yellowstone National Park. This map shows gravity stations located in Yellowstone National Park in 2017. Yellow lines are roads, dashed line marks the caldera boundary, black line outlines Yellowstone National Park, green circles note resurgent domes, and red dots are gravity stations. Changes in snow conditions at a gravity station in Yellowstone National Park are shown in 2017. Each photo is taken from about the same location in May, July, August and October of that year. The red circle in the May photograph shows the location of the gravity station in this area, which is near Craig Pass, a few miles southeast of Old Faithful. Is gravity changing at Yellowstone? In high school physics, we are taught that gravity is a constant — 32 feet per second squared is the gravitational acceleration on Earth, and it is the same everywhere. But it turns out that’s not quite true. In fact, the gravitational acceleration changes depending on elevation and the composition of the ground beneath your feet. Because of that, it’s a great tool for monitoring volcanic activity. As you get farther from the center of Earth, the gravitational pull lessens. For this reason a person that weighs 150 pounds at sea level will “only” weigh 149.58 pounds at the top of Mount Everest — a fringe weight-loss benefit of climbing that mountain. Local geology has an influence on gravity because of the density of the rocks in the subsurface. If there is a very dense deposit of copper beneath the surface, for example, the gravitational pull will be stronger than if the subsurface was made up of, say, uncompacted soil. Measuring the gravitational pull at the surface of the Earth can therefore tell you something about the composition of the subsurface. Gravity can also change over time. As an example, let’s say that magma gradually accumulates in a chamber beneath the surface. This means that more and more mass is being added to the chamber, which should result in a gravity increase over time. Similarly, if mass is lost — maybe because magma drains from the subsurface — the gravity will decrease over time. Based on this principle, gravity can be used to monitor volcanic activity. In fact, gravity measurements have been done on more than 50 volcanoes around the world, including Yellowstone. Gravity is measured using a specialized instrument called a gravimeter, or gravity meter — an uninspired name, perhaps, but it is at least descriptive. A gravimeter is essentially a very sensitive spring with a weight at the end of it. If the gravitational pull is strong, the spring becomes longer. Less gravitational pull means a shorter spring. Past gravity studies of Yellowstone Caldera have not yielded strong indications of gravity change, despite abundant ground deformation and earthquake activity that suggest the presence of magma beneath the surface. This might be in part because the magma is relatively deep — about 3.1 miles beneath the surface. The deeper the magma, the smaller the effect on gravity. It is also possible that there is too much “noise” to see changes in gravity due to magmatic activity. At Yellowstone, gravity change can also come from water moving around at shallow levels, and there might be impacts from snow accumulation and melting, atmospheric pressure changes and river and lake level variations. To better understand how gravity varies at Yellowstone, U.S. Geological Survey scientists collaborated with experts from the Royal Netherlands Meteorological Institute on a series of gravity surveys in 2017. 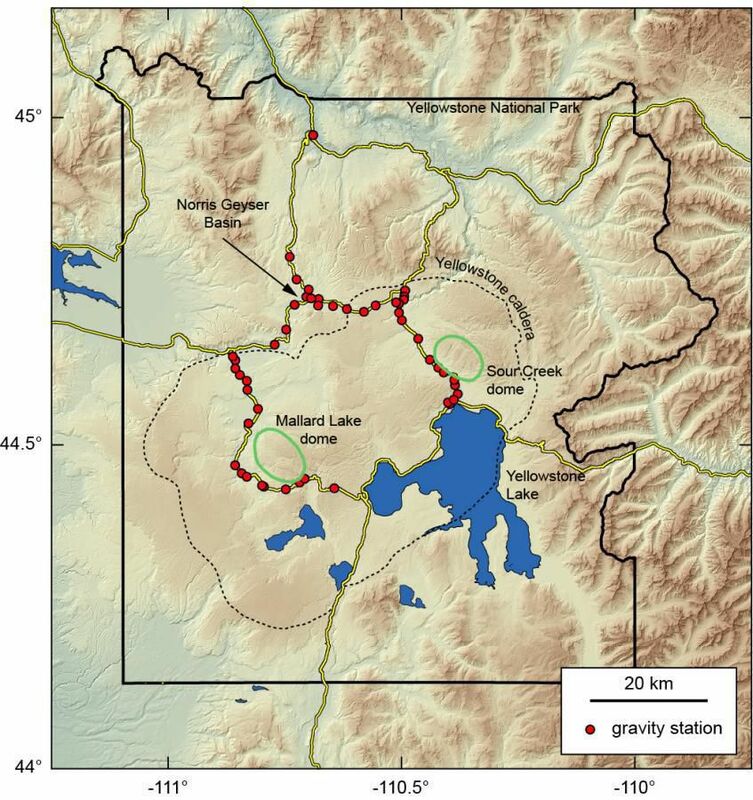 Measurements were carried out at stations near Norris Geyser Basin and across both resurgent domes in May, July, August and October of that year. The idea was to compare changes in gravity to changes in other factors, like snow and river levels, to see if there were variations across the seasons. The results of the work, published recently in the Journal of Geophysical Research, found that variations in groundwater, hydrothermal activity and other factors over the course of a few months were not a major contributor to gravity changes over time at Yellowstone. Basically, all of this “noise” was at about the same level as the error in the measurement itself. These results indicate that gravity is an excellent tool for monitoring future changes in magmatic activity at Yellowstone. Because variations in shallow water levels and other seasonal factors are relatively small, it should be possible to “see” any changes caused by magma. In the future, YVO will conduct annual gravity measurements in the caldera area to assess magmatic activity, combining those results with insights from deformation, seismicity, gas emissions and thermal changes. With these new insights in mind we will also re-examine past gravity data collected at Yellowstone by scientists from the University of Utah. The monitoring toolbox for Yellowstone is constantly growing. Yellowstone Caldera Chronicles is a weekly column written by scientists and collaborators of the Yellowstone Volcano Observatory.